A porcelain veneer is a thin shell that is placed over a tooth to create a variety of favorable outcomes from whiter teeth to a straighter smile. Veneers have been popular for several years and for good reason. They can help you get that movie star smile without the intense process that comes along with a more invasive procedure like crowns. 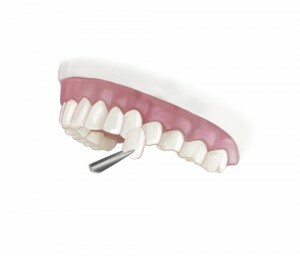 They require little or no tooth prep, meaning you get to keep most or all of your natural tooth. People typically consider porcelain veneers when they have a chipped or cracked tooth, minor misalignment, discoloration, gaps between the teeth, or the teeth have worn down over time. They are made to be virtually identical to your natural teeth. You may need only one or two veneers, or you may opt to have all of your teeth covered to create a brand new smile. There are two types of veneers: traditional and no-prep. When placing traditional veneers, your dentist will remove a thin layer of enamel from the tooth or teeth. No-prep veneers are very thin and require the removal of very little or no enamel. This is a great option for some, but not all. They can sometimes look bulky so not all patients will see this as a suitable option. Your dentist will be able to look at your teeth and discuss with you which option will produce a better result. Veneers have been honed since their invention in the 1920s to be one of the most practiced, popular dental procedures today. With proper care, veneers last 10 years or more. They act as natural teeth act and therefore should be treated like natural teeth. Brushing twice a day, flossing, and regularly visiting your dentist are all things you should do with or without veneers. It is also important to avoid excess stress like chewing your nails or clenching your teeth at night. If you think porcelain veneers could create your dream smile, we urge you to come in and talk us at the office of Michael Vito, DDS. We’d be happy to sit down with you and discuss your dental options. If you’d like to make an appointment, give us a call at (407) 905-9888.